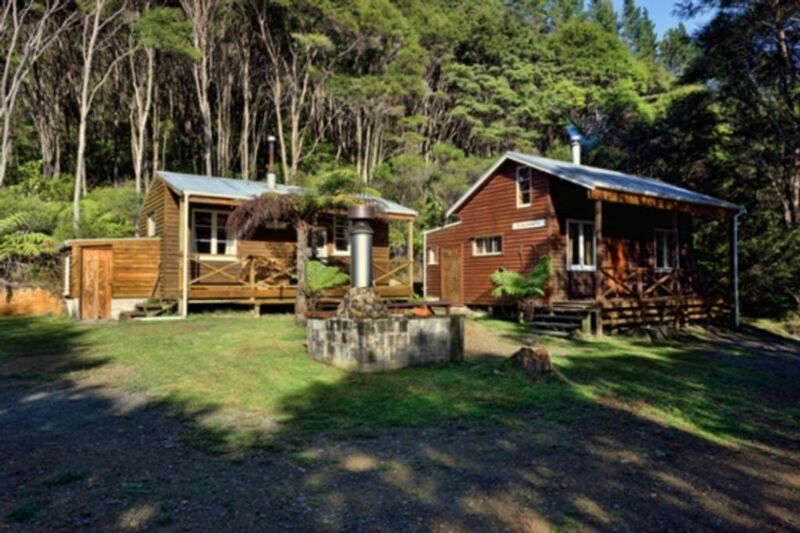 Wake up to the idyllic sounds of the birds and running stream in these beautiful lodges, situated about 2kms up in the bush in complete seclusion on Whitestar Station in Colville, 25mins north of Coromandel township on a 1260 hectare sheep and beef farm. The Bush Lodges fridge, lights and most of the hot water heating are powered by water generation. Bring the kids for a farm/bush experience or a romantic getaway or book both lodges for a group event (Listing #31486, sleeps 14 people in both and room for tents). Also have other houses to rent on same property. I have 9 horses available for guided trips around the farm or beach ride, Beginner and experienced riders can walk, trot or gallop through fields creeks bush with fantastic views of the valley and Moehau Mountain. 5 mins drive to Colville shop (sells everything from ice, bait, petrol, alcohol), Cafe (Harrys Kitchen), Art Galleries, Local produce meat, baking and coffee at the Hereford and a Pickle, Post office and Tennis courts. Tangiaro Kiwi Retreat is 30 mins north east of Colville in Port Charles its a Bar, restaurant and offers Bush Spas and Massage. 10-20 minutes drive to swimming / surf beaches. Pets allowed with prior approval one off charge applys of $10 per pet. 50% non refundable deposit required over peak summer period and major weekend events. Extra charges apply if bringing your motorbikes andamp; 4WDs to help maintain tracks. Please leave this beautiful ecological area as you found it and respect the area and buildings, a extra charge will be applied if any damage is done to the property or surroundings. BYO motorbikes, horses, 4WD, pets aloud. Smoking strictly outside! Such a good spot! We loved that we could bring our dogs and they got to have an adventure as well! The walks are cool and loved the horse ride! We will definitely be back!! We had a great time. We'll be back in spring. I have stayed before and love this spot for a weekend getaway with good friends. Basic accommodation but everything you need in a beautiful setting. Had a great time. Beautiful property and area! The lodge has everything you need with a great setting in the bush away from our busy life. We loved bush walks and the kids had a super time as well. We also enjoyed the farm tour which was a great experience for us all. Thanks Belinda. We look forward to making it back there sometimes. Had the most memorable family holiday with our children, will be staying for a week next time, 3 days was just not long enough. So much to do and see, the bush cabin was so clean and had everything we needed, beautiful clear swimming hole. My daughter and I had the most amazing horse trek down to the beach would definitely reccomend ! !